I am a total sucker for all kinds of baked goods. I love the aroma as it bakes, how it fills the kitchen with warm sweet smells, comforting and homey. And now that Layla likes helping me in the kitchen, baking is all the more enjoyable when we can make it a weekend activity! Recently, we had a ton of leftover bananas that were getting way too ripe. The obvious answer was banana bread, but this time I wanted to change things up and make it more of a sweet treat for all of us to enjoy. So here it is: my Chocolate Chip Banana Bread! 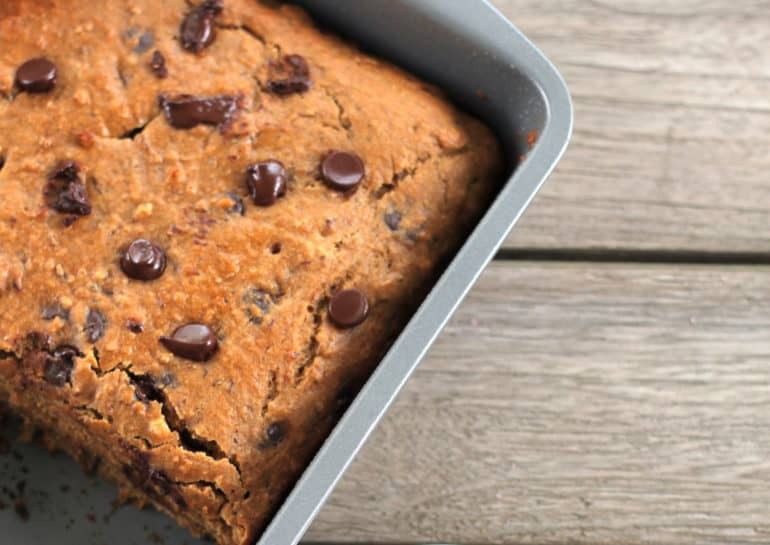 Many people wonder whether banana bread can be made healthy: especially chocolate chip banana bread? My answer to this is YES! For this recipe, I was inspired by a recipe I found on Well Plated, but I modified it to make it even healthier, lower in sugar and higher in fiber! Even with the modifications though, it stayed super moist and perfectly sweet. 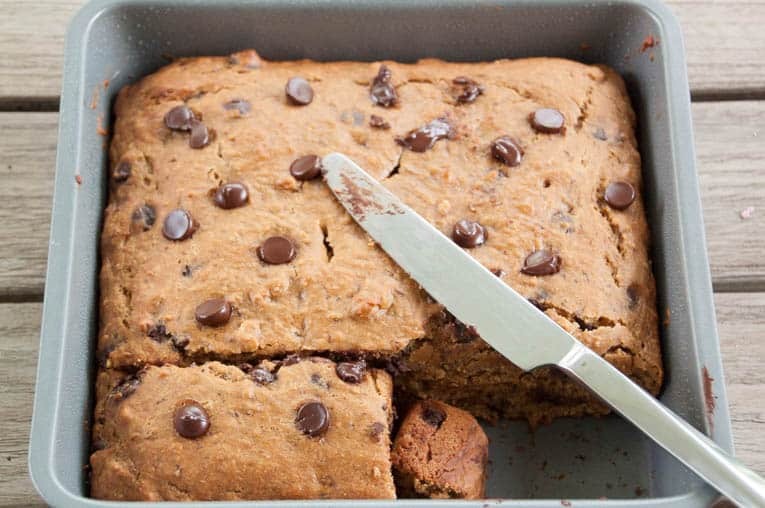 It’s great for a guilt-free treat, or if you’re looking for a healthier dessert for kids! It’s super simple and is ready in less than an hour (baking and prep time included). Step 1: Preheat oven to 350°F. Lightly grease an 8 x 8-inch pan with olive oil spray and set aside. Step 2: In a large bowl mash the bananas until mostly smooth. Whisk in the flax egg, then the yogurt and oil. Whisk in the coconut sugar, maple syrup, and vanilla. Sprinkle the baking soda, cinnamon, and salt over the top, then stir until combined. Gently stir in the flour until barely combined, then fold in the chocolate chips. Step 3: Scrape the mixture into the prepared pan. Bake for 25-30 minutes, until a toothpick inserted in the center, comes out clean. Remove from oven and let cool for 15 minutes. Cut into 16 squares and serve. 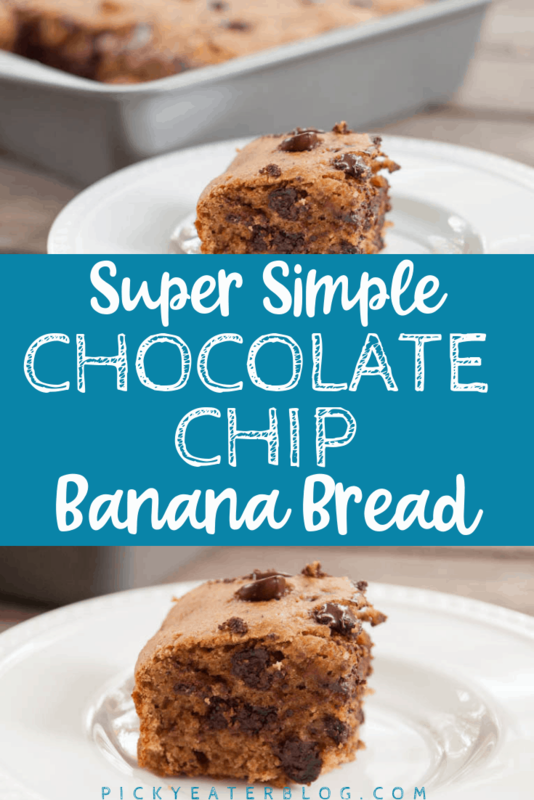 If you want to make healthy chocolate chip banana bread muffins it super easy! Just lightly grease the muffin tins (a 12 muffin tin will work well here). Divide the batter evenly. I love to use this scoop to make sure to have muffins all the same size – it makes dividing up muffin batter SO much easier. Once divided evenly, bake at 350℉ for 20 to 22 minutes, until a toothpick inserted in the center comes out clean. 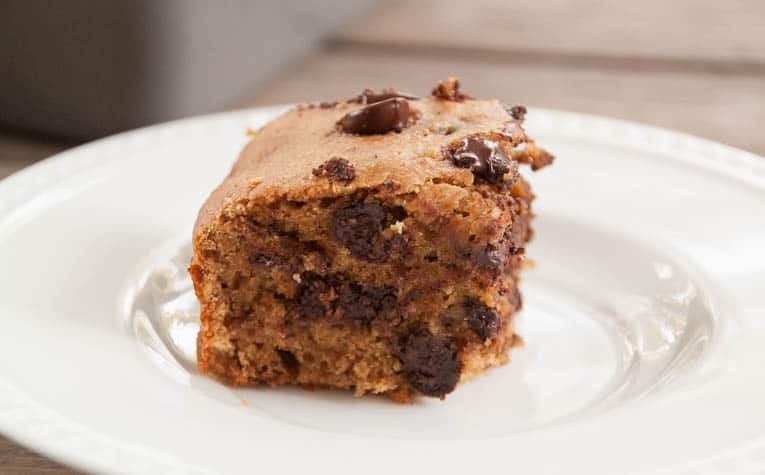 This recipe can be made gluten free (just use gluten free oat flour) and vegan (use a non-dairy yogurt). 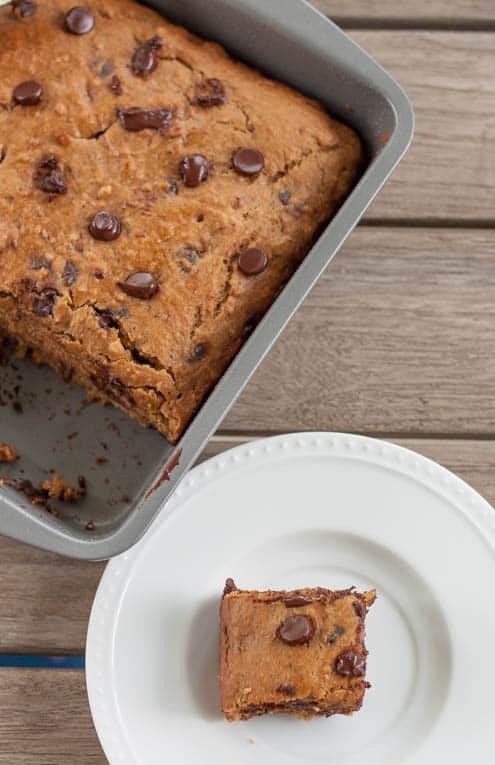 You will not believe that this banana bread is made without butter and eggs – it tastes just like a traditional banana bread recipe! Once it’s made, I like to store it in an airtight container in the fridge so that it lasts longer – it’ll last up to 2 weeks in the fridge. 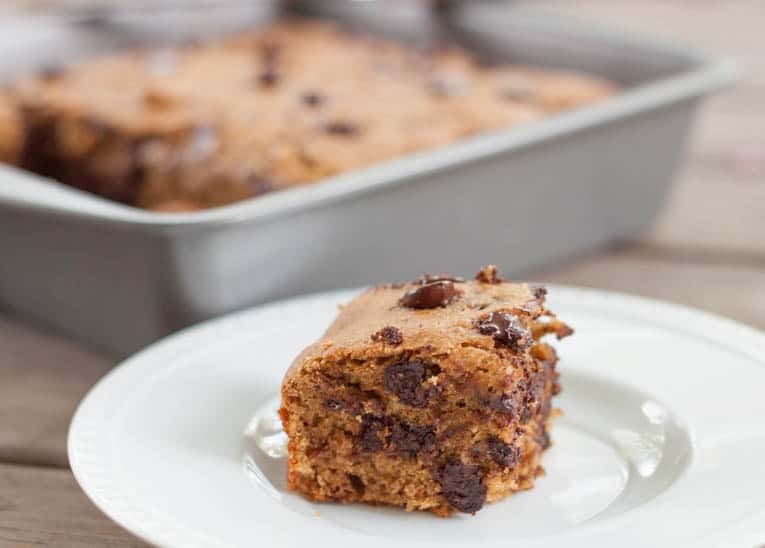 I have heard that banana bread also freezes really well – although I haven’t tried it myself with this particular recipe. 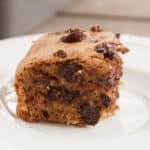 This is the perfect recipe to bake in advance if you’re looking for a healthy sweet treat to have on hand, if you want a healthier snack for your kids, or if you want to make a quick homemade gift for a friend! Greek yogurt adds moisture but cuts down on added oils. 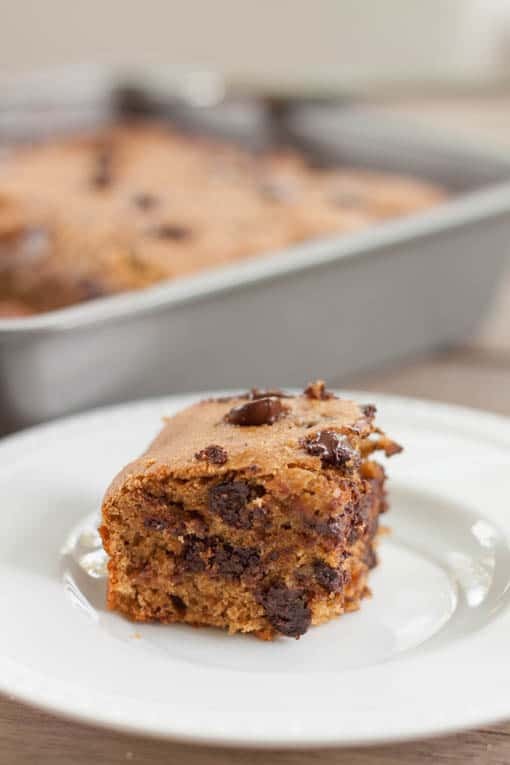 This chocolate chip banana bread is a perfect snack or breakfast. Preheat oven to 350°F. Lightly grease an 8 x 8-inch pan with olive oil spray and set aside. In a large bowl mash the bananas until mostly smooth. Whisk in the flax egg, then the yogurt and oil. Whisk in the coconut sugar, maple syrup, and vanilla. Sprinkle the baking soda, cinnamon, and salt over the top, then stir until combined. Gently stir in the flour until barely combined, then fold in the chocolate chips. Scrape the mixture into the prepared pan. Bake for 25-30 minutes, until a toothpick inserted in the center comes out clean. Remove from oven and let cool for 15 minutes. Cut into 16 squares and serve. Why don’t you just say 3/8of a cup of sugar? Very good but the amount of chocolate chips is maybe too much. Chocolate flavour overwhelms others. And that’s coming from a chocolate lover! Fair enough! I could have written it that way 🙂 I just put it as 1/4 + 1/8 because it’s how I measured it out (I don’t have a 3/8 cup measure 🙂 ). You can always use less chocolate chips if you’d like! My chocolate was super super dark, so it didn’t make the banana bread too sweet.